Just saw this in a Facebook group I belong to (YL Essential Oils Basic 101 for Beginners, run by a great lady, Debbie Dennison). There have been some challenges with out-of-stock oils and while some folks are patient, others are getting itchy. Here are Gary Young’s suggested substitutes for out-of-stock oils. Also noted: YL is thinking of incorporating info on substitutes right next to the product descriptions in their next catalog. Brilliant! This change will give distributors more chances to educate on the various oils and their properties, allowing you to broaden your knowledge and have suggestions right at your fingertips. More information on this excellent change will become available in the next few months. Pass this information on to your own YL community by using the Share buttons on this post. This is good news! Simply put, a carrier oil is any cold-pressed, unrefined vegetable, seed or nut oil used to dilute full-strength essential oils. If you Google coconut oil, you’ll be met with a million articles about how it can cure everything and make you look like you’re 20 years old. It is some pretty good stuff, and it smells delicious, too. Because it absorbs into the skin more slowly, coconut oil makes a good carrier when you want to enjoy the aromatherapy benefits of your essential oils a little longer (as in, when you make a eucalyptus oil rub for a chest cold). Coconut oil solidifies at 76 degrees, so when you’re mixing up topical treatments, warm it a little, add your essential oils and mix thoroughly. It melts beautifully later when you apply to skin. Got achy joints? Avocado oil plus PanAway. Got achy teeth or problems with your gums? Avocado oil plus Thieves oil. Need a good carrier oil for a sensual massage? Avocado oil plus jasmine essential oil. Sunburn? Wait for it… Avocado oil plus lavender. Plus, it’s super-good in salad dressing. If you have sensitivities to nuts, this may be the carrier oil for you. As with anything, test a little on your wrist before going all the way. Yeah, we hardly need to discuss the benefits of olive oil, right? Most of us have a big bottle in the kitchen already, making it easy to mix with essential oils. Look for extra virgin, cold-pressed oil because it’s worth the money. Olive oil is one of the slowest to absorb into the skin, so it makes a great carrier oil when mixing up oils for babies and kids. If you’re feeling brave and don’t mind rinsing out the shower afterward, mix ¼ cup used coffee grounds, 1 tablespoon EVOO and five drops of rosemary essential oil and give your scalp a good scrub. Yep, it’s messy, but try it and see how you feel. Lots of vitamin E and protein make almond oil a nice choice as a carrier oil. Those who suffer from psoriasis and eczema may prefer it over other choices. If you like to put oils on your feet, try mixing them with almond oil to give those rough spots a little extra TLC. If you’re mixing capsules to take internally, almond oil adds just a touch of trace minerals that may help your body heal faster. Every little bit counts! Gentle for babies, too. If you’ve been using baby lotions, try a nice massage with almond oil instead. Almond oil typically absorbs quickly, so when you mix it with essential oils the properties of each oil go into your skin right away. If you’re making home-made beauty products with essential oils and want the best carrier oil, shea butter might be the one. Or, maybe it isn’t—depends on the results you want from your DIY adventures. Shea butter is water resistant, meaning it creates a protective barrier that keeps water away. Good for hand moisturizing if you tend to wash your hands frequently (say hello to all the nurses and day care providers in your life!). However, this also means the shea butter stays on the surface of your skin after the essential oil has been absorbed. It’s a toss-up, and you should decide after trying various carrier oils for various purposes. For those who find other carrier oils greasy and unpleasant, grapeseed oil may be the answer. It’s quick to absorb and leaves behind a silky feeling. When you’re mixing essential oils with a carrier oil for kids, it can be hard for them to be patient until the oil absorbs into their skin, so grapeseed oil might be the perfect carrier. Read labels and study brands very carefully, though. Grapeseed oil is often extracted using chemicals and traces of bad stuff can be left behind after processing, so look for expeller-pressed oils that are crushed using mechanical processes rather than chemistry. And of course, there’s always V-6, which you can order directly from Young Living. No matter what kind of oil you use, try to get organic, non-GMO brands. If you’re trying to be healthful by using essential oils, you might as well go all the way, right? Please take care of your oils, too. 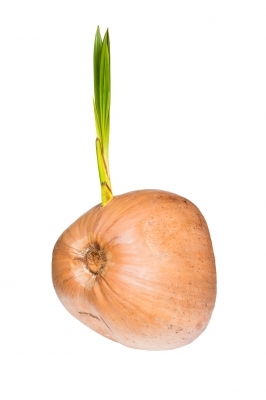 Many can be stored in the refrigerator to prolong their shelf-lives, and some can go in the freezer and remain liquid. If your oil has been in room-temperature storage for a few months, smell it—if there’s any hint of “off” odors, just throw it away and start over. Anyone with a new baby or a rambunctious toddler absolutely needs the energizing, cleansing and grounding effects of essential oils. Nurturing little ones can get stressful, and your gifts can help parents find balance in a newly chaotic life. Tired new parents can find relief in stimulating oils. A gift of Peppermint can be used in a variety of ways, including perking up when you’ve been awake for too many weeks in a row. Rosemary is an all-around energizing oil, or give the gift of Orange if the new parents need calming and uplifting aromatherapy. A diffuser is the perfect way to introduce these lovely scents into the environment. When cold and flu season hits the household, new parents should make liberal use of Eucalyptus essential oil. Rub a few drops onto blocked sinuses, sore throats and achy chests whenever needed. (For grownups! Essential oils must be properly diluted before applying to babies and very young children.) Add a drop or two to steaming tea or a diffuser. In addition to relieving cold symptoms, eucalyptus oil has antibacterial properties, so add it to your homemade household cleaners to reduce the number of germs on surfaces. Did you know that even new dads can suffer from postpartum depression? A dad’s symptoms are usually much less severe than a mom’s, and he can often be ignored in the mix. If you feel like splurging, give a new dad the gift of Frankincense essential oil. Gifts with smaller price tags include Cypress and Cedarwood, both well-known for their grounding properties and their more masculine scents. 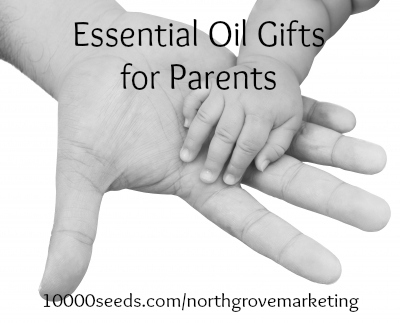 As you consider the best gifts to give new parents, remember that essential oils have many incredible properties beyond their aromatherapy benefits. Give your gift recipients some advice along with the essential oils and they’ll be more likely to use them! You may redistribute this article on your personal Young Living blog as long as you include this byline: Written by Evelyn Fielding of North Grove Marketing http://10000seeds.com/northgrovemarketing. If you’d like to redistribute on your business Facebook page or group, simply copy and paste this link: http://10000seeds.com/northgrovemarketing/essential-oil-gifts-for-parents/. A ten-minute foot massage can work wonders to relieve stress and emotional tension, and focusing on the reflexology points on your feet gets you results even faster. Throw in some calming aromatherapy through essential oils and you have a complete stress relief package. Wash your feet with plenty of running water and a mild soap. Dry using gentle circular motions. Focus on what you’re doing right now and try to set aside your worries for a few moments. Pour a small amount of V-6 carrier oil into your palm and rub your hands together to warm up the oil. Drip 4-6 drops of essential oil into your palm and rub your hands together again. The Peace and Calming blend is perfect for all kinds of stress. If your stress is related to female hormones, use the Progessence blend instead. Spread the oils onto one foot and massage the top and bottom of your foot all the way up the ankle. Use long strokes and don’t press too hard on any particular point. 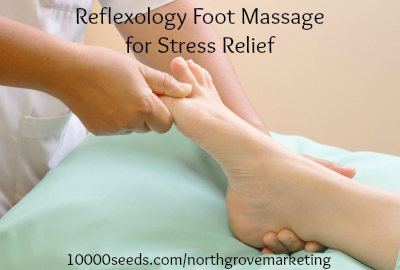 Begin the reflexology part of the massage by applying pressure where each of your toes meets the bottom of your foot. Press firmly for about ten seconds in each depression. Spend extra time with your big toe, because it represents your entire head and neck in reflexology. Move down to the ball of your foot and repeat, holding each pressure point for about ten seconds. Pay extra attention to the point where your toe bones meet your insole, as this can be a very tender spot. Move to your insole and massage the whole area, paying attention to the reflexology points in the edge of the arch of your foot. We tend to hold emotions and tension in this area, so take your time and focus on any particularly tender points. End the reflexology part of the massage by finding the point on the outside of your foot about three finger-widths past the joint of the little toe. This is where you hold tension in your shoulders. Press and hold this point for at least ten seconds, and repeat until you can feel your shoulders relax. Finish massaging that foot in any way you like: vigorous circular motions all over your foot; long, gentle strokes from toe to heel; briefly pressing on each reflexology point again to relieve the remaining bits of tension. Rest for a few moments and take a drink of water. Repeat the same reflexology massage points with your other foot. When finished, relax and drink water for at least a few minutes before going back to your everyday life.